Manitoba Opera is currently showing Madama Butterfly, a piece previously questioned as being racist or being an example of cultural appropriation. The opera debuted in 1904 and depicts the ill-fated love of a Japanese girl and an American soldier. Before the production run began, a panel discussion was held at the Canadian Museum for Human Rights to discuss the occurrence of cultural appropriation in the arts. Panel members included Madama Butterfly lead Hiromi Omura, WAG curator of Indigenous contemporary art, Jaimie Isaac, and Sarasvàti Productions artistic director, Hope McIntyre. The panel discussion was moderated by CBC radio personality Ismaila Alfa, host of CBC Radio’s Up to Speed and a former touring hip hop artist. At the panel, Alfa asked questions directly related to Madama Butterfly, and more generally related to cultural appropriation. During the panel discussion, Isaac discussed some of the misconceptions of what cultural appropriation means. “I think taking aspects of a culture and using it without context, without permission and gaining from that in some sort of way. The differences between cultural exchange is having the conversations and ideas of reciprocity between cultures,” Isaac said. Isaac helped to curate the INSURGANCE/RESURGANCE exhibit, which features works from 29 contemporary Indigenous artists including Kenneth Lavallee, Dee Barsy, and Dayna Danger. Every piece in the exhibit touches on a theme of political resistance in some way. “When you’re given some sort of platform or privilege to be able to speak, speaking for someone else is the difference between exchange and appropriation,” Isaac said. Downie used his platform as a popular Canadian rock musician to create a ten-song album inspired by the story of a young man named Chanie Wenjack ,who died trying to escape from a residential school. According to Isaac, Downie wasn’t just speaking for others who couldn’t speak for themselves. Creating platforms for people to speak for themselves in the arts has a process, according to McIntyre. “At any point, we make sure they have the power to say no, this isn’t working, this doesn’t make sense, or we want this clarified. And for me, that’s the exchange. Where there’s willing consent about what’s being used, and there’s participation throughout the process,” McIntyre said. Sarasvàti Productions, McIntyre’s theatre company, works to create theatre that engages with social issues like racism and sexism. For Omura, the world renowned soprano performing as the titular Madama Butterfly, the difference between appropriation and exchange is about openness and a willingness to learn. She has performed in Madama Butterfly productions around the world, and has worked with stage directors of different backgrounds. Manitoba Opera recognizes that different productions can have different issues in their content, and as a result deliberately try to create discussion around these works. Examples of harmful appropriation and helpful exchange came up throughout the discussion. Isaac cited fashion designer duo Dsquared2 as participating in cultural appropriation through their line #Dsquaw, while also citing fashion designer Valentino as participating in fair cultural exchange through his collaboration with Christi Belcourt, a renowned Métis artist. “That is a really good example of cultural exchange and not so much appropriation because that was acknowledged. It was his designs and her designs on his dresses and his whole line,” Isaac said. “I just feel like there’s more people to be able to speak to their own cultures. There’s more opportunities for people to say ‘Oh we’re really interested in these Indigenous designs, so we’re interested in working with Indigenous designers, or Indigenous playwrights or writers or curators.’ And I think we’re sort of past a time where we can say there’s no one that does this,” Isaac said. 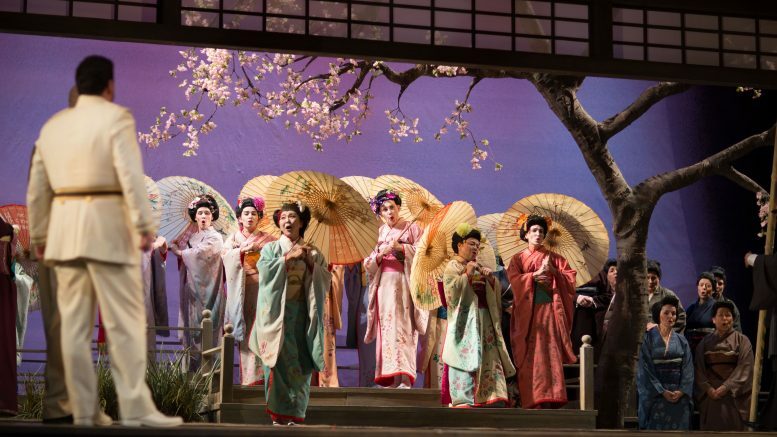 The final performance of Madama Butterfly is on Nov. 24 at the Centennial Concert Hall.